Since 1984, Jewelry Design Gallery has been serving New Jersey with everything jewelry, from sales to custom made pieces and repairs! 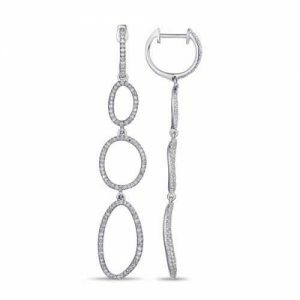 For a unique pair of custom earrings that really take your personalized jewelry collection to a whole other level, come to Jewelry Design Gallery. If you’re looking for a pair of unique diamond earrings, a dangling pair with multiple gemstones or some simple unique studs because you have a set style in your imagination that you’ve been dreaming of, we’ve got what you’re looking for! Our jewelry designers use the latest in CAD/CAM design and 3-D printing technology to create custom fine jewelry that is out of this world. We make custom earrings in all different metals, utilizing all different gemstones. From the original molding, to casting, and then setting stones (if wanted), our custom fine jewelry from earrings to rings are treasures that our client list of over 50,000 people love throughout the years. And in addition to our custom selection, we also have a large variety of earrings styles in stock, from dewdrops to studs and more. Come see all the jeweled possibilities. Visit us and start creating your new favorite pair of earrings today!